Sun, C.; Puig, V.; Cembrano, M.
A multi-layer model predictive control (MPC) scheme with temporal multi-level coordination for regional water networks is proposed. First, a multi-layer control structure resulting from a functional decomposition of water network is briefly presented. Inside each layer, a MPC based controller is used. Between related layers, a temporal multi-level coordination mechanism is used to generate control strategies which consider objectives and time scales of both layers. The proposed approach will be applied to the Catalunya Regional Water Network. The paper presents the results based on an aggregate model of this network. 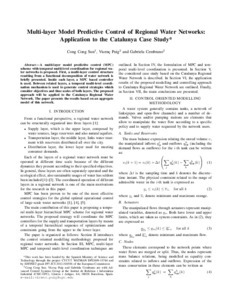 Sun, C.; Puig, V.; Cembrano, M. Multi-layer model predictive control of regional water networks: application to the Catalunya case study. A: IEEE Conference on Decision and Control. "Proceedings of the 2013 IEEE 52nd Annual Conference on Decision and Control: CDC 2013: December 10-13, 2013: Florence, Italy". Florència: Institute of Electrical and Electronics Engineers (IEEE), 2013, p. 7095-7100.